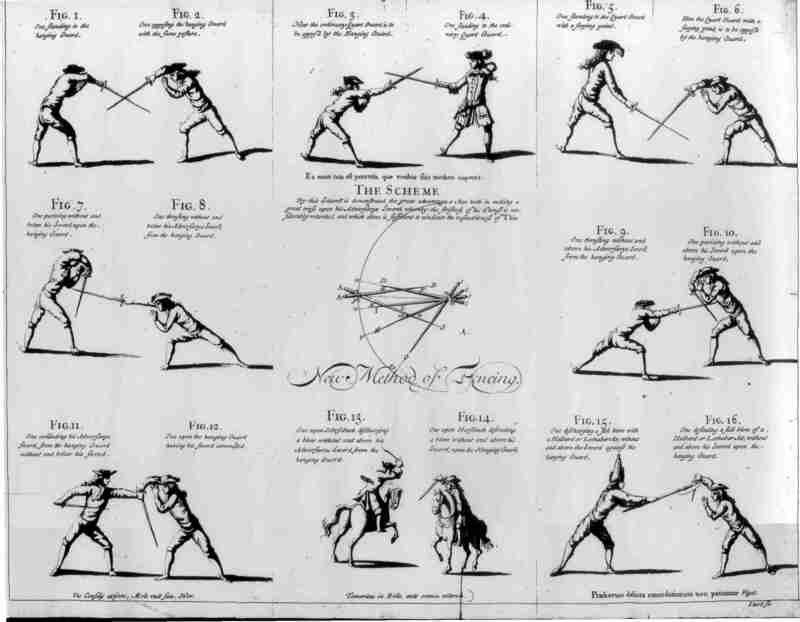 A New, Short and Easy Method of Fencing: Or the Art of the Broad and Small-Sword Rectified and Compendiz'd. Wherein, the Practice of these Two Weapons, is reduced to so Few and General Rules, that any Person of an indifferent Capacity, and ordinary Agility of Body, may in a very short time attain to, not only a sufficient Knowledge of the Theory of This Art, but also to a considerable Adroitness in Practice; either for the Defence of his Life uppon a Just Occasion, or Preservation of his Reputation and Honour, in any Accidental Scuffle, or Trifling Quarrel. The New Method was Sir William's adaptation of the English method to incorporate the use of the small-sword and spadroon. It is a simple system that is effective for self-defence and easy to learn, thus suiting most fencers who wish to preserve their lives with sharps. If you find this page of use, consider buying the this modern interpretation or the earlier Hope and McBane reprint (with accompanying poster).